Staphylococcus aureus causes bacteremia, pneumonia, and septic shock that are associated with mortality rates of 10%, 30% and 55%, despite appropriate antimicrobial therapy. Using relevant rabbit infection models, we have shown that specific staphylococcal toxins played critical roles in disease pathogenesis. We further showed that active immunization with toxoids or passive immunization with specific anti-toxin antibodies reduced mortality in animal efficacy studies. Adjunctive therapy with anti-toxin antibodies, either alone or in combination with anti-staphylococcal antibiotics, improved animal survival outcomes. These active and passive immunization approaches are currently being evaluated in human efficacy studies (Phase I/IIA). In this lecture, I will offer my insights on how we are translating basic science discoveries to the development of novel vaccine and immunotherapeutics to combat a major infectious disease problem. Dr. Diep received his BA (2000) and PhD (2005) from UC Berkeley and his postdoctoral training (2008) from UCSF. He is currently an Associate Professor at UCSF. Dr. Diep has long-standing research interests in the clinical and molecular epidemiology and pathogenesis of multi-drug resistant infections (55+ publications, >7000 citations). His group was among the first to characterize widespread disease epidemics caused by the community-associated MRSA clone USA300. He directed NIH R01-sponsored development of rabbit models that demonstrated mechanisms by which staphylococcal toxins cause lethal pneumonia. In his recent translational work, Dr. Diep and industry colleagues showed that active immunization with toxoids and passive immunization with specific anti-toxin antibodies reduced mortality and prevented major morbidity in preclinical efficacy studies. 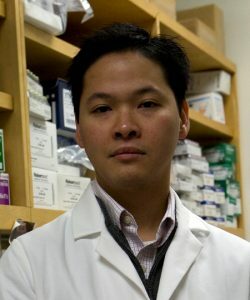 Disclosures: Dr. Diep was funded by United States National Institutes of Health (NIH), Food and Drug Administration (FDA), Department of Defense DARPA, Biomedical Advanced Research and Development Authority CARB-X, and various industry partners, including Achaogen, Arsanis, AstraZeneca/MedImmune, Genentech, Integrated Biotherapeutics, Merck/Cubist and Pfizer.